Bake the No Name® Parmesan Crusted Chicken Breast according to package directions. Cook the sausage, onion and red pepper until the sausage is nicely browned. Drain the fat from the sausage mixture. Let this mixture cool for approximately ten minutes. Mix the softened cream cheese with sour cream, ½ of the mozzarella, and ½ of the parmesan, basil, oregano, and salt. Blend the cooled sausage with the cheese mixture. Spread the blended mixture into an oven safe container. Pour the pizza sauce over the sausage and cheese mixture. Sprinkle the remaining mozzarella and parmesan on top of the sauce. Bake at 375 degrees for 25-30 minutes or until the mixture is heated through. 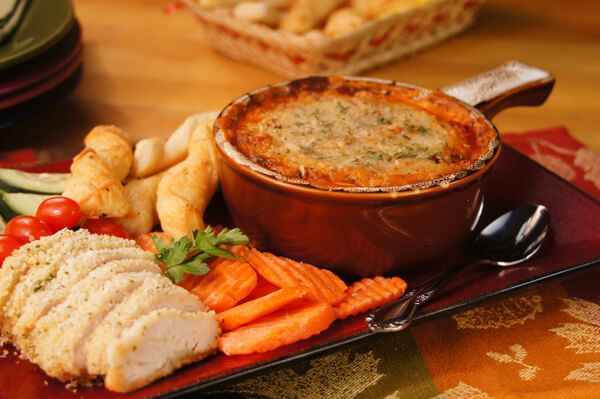 Cut the chicken breast into ¼ inch thick slices and serve the Italian Sausage Pizza Dip on the side. You can also serve the Italian Sausage Pizza Dip with homemade bread sticks or a variety of crackers.